In March 2010 I was in the U.K where I met up with an ex-Ferarri dealer, semi-retired living in Bristol. 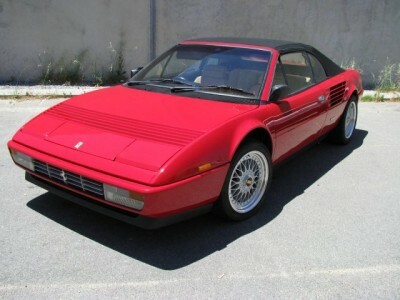 Ended up buying this beautiful ’87 Ferrari Mondial 3.2 Cabrio and finding out it was one of only 57 ever made. Sold by Nigel Mansel Sports Cars to a doctor in a champagne breakfast at the Ritz, then charity raced against the Orient express train to Venice Italy! The previous owner has replaced (through the retired Ferrari dealer friend) the soft top, done buff and touch-up to the paint(after sitting in a barn for 10 years) and had the cam belts replaced just before I purchased. Since arriving in Australia in late September 2010 and giving it a birthday with new Iridium spark plugs, Fuchs oils and factory filters and have replaced the original (65th klm) clutch kit with a new one. At the same time face the flywheel, replace rear main oil seal and clutch master cylinder, buy new after market 17″BB5 wheels and new tyres. Now it is a pleasure to drive with the top down! Now the Ferrari has a new LH Headlight lift rod ($350 local dealer!??) $90 from a U.S Ferrari parts supplier and a speedo from eBay U.S. it is looking and driving like it should! It will be on “Normal Licence” soon to enjoy a drive or two! Update Feb’ 2013, Yes something is really happening. For licencing purposes a kilometer Speedo has been purchased now fitted, but the original is included with it, as is the TRX wheels and tyres. The car has already a factory immobilizer so that side is fine but the door bars are needed and thats second on the list to those dam child restraints! Being a convertible and a 2+2 there is no room for lap sash belts or child restraint plates. A friendly automotive engineer is looking at them to determined whether they could actually fit, the factory didn’t do it so maybe there is a reason! Update March 2013 – A deal involving a few trade-in cars and some cash has been agreed upon! Deal to be completed when Ferrari is pit passed.